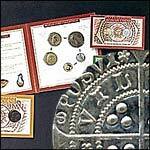 Reproduction Historic Coins - Roman Coins- Dark Age Coins - Medieval Coins - Renaissance Coins. Our replicas of historic coins cover a broad range of dates and will satisfy the needs of living history groups and collectors. Our mint produces a range of semi-replica hammered coins that really do look and feel authentic. Weights, alloys, and fineness are kept close to the original remedies. Original coins are carefully analyzed to determine engraving techniques and over 35 years experience is used to recreate the dies in fine detail. Our mint acts as a real period mint with its own mintmark, issuing coins under its own name. There has long been a controversy over replicas with this degree of accuracy. Are they replicas or forgeries? Our mint, in an effort to answer this, has offered a reasonable compromise. In addition to issuing coins under their own nationally recognized mintmark, they also alter the legend slightly to distinguish these coins for what they are. Additionally, an example of each of these replicas is held by the British Museum for reference. Our Aethelred II Saxon Silver Penny Replica Coin is a 978-1016 A.D. Saxon Silver Penny of the Long cross type. Sterling silver. Ethelred II known as the unready is from the Anglo-Saxon UNREDE meaning without counsel, that is without good advice. Our Athelstan Medieval Saxon Penny is a Saxon Replica Coin of the small cross type. King Athelstan 924 - 939 A.D. Silver Penny from sterling silver. In 927AD Aethelstan invaded Viking Northumberland and laid claim to the title of 1st King of England. Our Charles I Coin is a replica Tower Silver Penny from 1625 - 1642 *** Made from sterling silver. Each of our replica historic coins will satisfy the needs of living history groups and coin collectors. From the Iron Islands of Westeros comes this copper star coin from house Greyjoy. Our Charles the Bold Medieval Replica Coin is a Circa 1474 Billon Flanders Groat - Original alloy specifications, approx. 60-70 percent sterling silver - copper alloy. Our Charles I Threepence is a reproduction Silver Threepence from1638 - 1639 *** Made from sterling silver. During this time period coin presses existed for minting coins, however they used the faster hammering method to produce the original coins. Our Charles I Farthing Historic Coin is a replica Circa 1625 Copper Royal Farthing. Made from Copper. Copper farthings had been struck and issued privately under licence during the preceding reign of James I. Our Charles the Bold Medieval Coin is a Circa 1474 A.D. Billon Double Stuiver or Eight Pence. Original alloy specifications, approx. 60-70 percent sterling silver. Charles the Bold was the Duke of Burgundy in the fifteenth century. Our Coins of the Bible, Set One are minted from originals, these accurate looking and maybe more important, feeling, coins are as close as you can get to trading the actual currency from eras gone by. Our Coins of the Bible, Set Two are minted from originals, these accurate looking and maybe more important, feeling, coins are as close as you can get to trading the actual currency from eras gone by. One clear plastic coin holder with chain, for wearing a coin as a necklace without having to drill it. This fantasy coin takes inspiration from The Princess Bride as well as the real pirate Black Bart (or Bartholomew Roberts). Our Edward I-III Medieval Coin is a replica coin from 1272-1377 *** Made from sterling silver. Each of our replica historic coins will satisfy the needs of living history groups and coin collectors. These coins are semi-replica hammered coins. Our Elizabeth I Renaissance Coin - Replica 1558-1603 Silver Half Groat or Two Pence. Made from sterling silver. During the reign of Queen Elizabeth I there was almost a complete recoinage of British coins. Gold and silver coins were effected most. Our Eric Bloodaxe Viking Silver Penny is a Replica Coin Circa AD 947-48 and 952-54). *** Made from sterling silver. From AD 954 the Vikings began to raid Britain. Coins such as this were used for the Danegeld protection money. The Danegeld was only partially successfully as of course the Danes kept coming back for more. Our Copper Penny Tavestock Coin 1811 is a Replica of a British Penny Token Made from copper. A privately issued token, the coin had no official legal tender value. This penny, typical of period tokens shows local a view of the Devon Mines. Our English Civil War Replica Coin Set Comes with two different coins - Charles I Half-crown 1646 from siege of Newark and a Commonwealth shilling 1653. The Edward I and Edward II Medieval Coin Replicas a Silver Penny, minted at London and found in 1963! Card gives an overview of the struggles between King Edward I (longshanks), William Wallace (Braveheart) and Robert the Bruce. Replica of the iron coin given to Arya Stark in Game of Thrones. This heavy copper is from Westeros, and features the had of King Robert Baratheon late in his reign. The last ruler of the independent North Kingdom was Torrhen Stark, whose castle at Winterfell features heavily in the first of author George R.R. Martin's novels. This unusual piece is an example of wire coinage; coins which are struck with primitive tools along a length of heavy wire, and worn as armbands or bracelets, but may also be cut apart as needed for use as currency. This armband is an example of wire coinage; coins which are struck with primitive tools along a length of heavy wire, and worn as armbands or bracelets, but may also be cut apart as needed for use as currency. This small silver is from the land far to the east of Westeros known as Vaes Dotherak, or the land of the Dothraki horsemen. It is an example of wire-coinage. This copper half groat is in heavily circulated condition and weighs 5 grams. From the Iron Islands of Westeros comes this copper penny from house Greyjoy. Minted after Daenerys, Mother of Dragons, declared herself Queen of Mereen. About the same denomination as a Westerosi Half-Dragon. Daenerys issues this Golden Mark to proclaim, once and for all, her hatred of slavery in all its forms. Our Gold Doubloon Replica is also known as 2 gold Shields (Doblón). It was coined during the reign of Felipe II between 1556-1598. Our Gold Doubloon Crest coin was coined in Seville during the reign of Felipe II between 1556-1598. The perfect addition to any collection, or a great way to get one started. Our Gold Shield Replica Coin is modeled after a coin originally minted during the reign of Felipe IV in 1637. Our Henry VI Groat Replica Medieval Coin circa 1430 a Fifteenth Century Silver Groat. Sterling silver. King Henry VI reigned from 1422 to 1461 and from 1470 to 1471, his reign was interrupted by Edward IV. Great for living history groups and coin collectors. Our Henry VIII and Elizabeth I Deluxe Coin Set Contains a medal from 1545 to commemorate Henry Viii as Supreme Head of the Church of England. The Renaissance Coin Set also includes an Elizabeth I silver crown 1601. Our Henry VIII and Elizabeth I Renaissance Coin Set Includes two different Ren. coins - Henry VIII Groat 1509-1547 and Elizabeth I Sixpence 1558-1603. Our George III Revolutionary War Coin Set 1760-1820 Contains 3 coins - 1 Shilling, 1 Sixpence and a 1/3 guinea from the time period of the American Revolution and the Napoleonic War. Our Mary Queen of Scots Replica Coin is a Silver Testoon (5 Scots Shillings) of Francis and Mary dated 1560. The George IV and Victoria Replica Coin Set Contains 2 coins - A Crown of George IV 1821 and a Gold Five Pound of Queen Victoria. The nineteenth century was an opulent time and many examples of the lavish lifestyles remain. The George VI Silver Threepence WWII Replica Coin is a 1936-1952 Reproduction Coin. During World War II two pence would buy a pint of rationed milk. Three pence would buy 1lb of oatmeal and for five pence you could buy a packet of cornflakes. Our George VI The Blitz Bronze Farthing is an Original WWII Coin. During World War II a farthing would have bought one whole eggs worth of rationed dried egg. An Original George VI Air Raids Bronze Half Penny from WWII 1936-1952. During World War II oranges and lemons were a penny each, 1lb. of cheese was ten pence and 1lb. of bacon was 18 pence. The George VI Rationing Bronze Penny is an Original 1936-1952 WWII British Coin. Obverse - Bust of King George VI Reverse - Britannia. Our George VI Silver Sixpence WWII is a 1936-1952 Reproduction British Coin. During World War II a female trainee in a factory would be paid £ 1.18s per week. These Medieval Coins Florin 10 Pieces 1325-1355 come as a set of 10 in a Brass finish. A reproduction Athens Gold Stater coin with Athena wearing a helmet on the obverse and an owl on the reverse. Sold in Quanities of 10. A reproduction Athens Silver Didrachm coin with Athena wearing a helmet on the obverse and an owl on the reverse. This is made or Lead free pewter. Sold in Quantities of 10. A reproduction Corinthian Silver Didrachm coin with Athena wearing a helmet on the obverse and a flying Pegasus on the reverse. Sold in Quantities of 10. This Leather Bag of Pieces of Eight calls to mind the nine pieces of eight discussed in Pirates of the Caribbean: At World's End. Brass replica of the iron coin given to Arya Stark in Game of Thrones. This silver stag is struck in pure .999 silver, weighing approximately 3.1 grams. Eddard (Ned) Stark was Warden of the North in Westeros. This silver token is from an establishment called The Peach in Stoney Sept, Westeros from Game of Thrones. This Copper star is from the land of Dorne, in the southern part of Westeros. This brass half penny is from the land of Dorne, in the southern part of Westeros. The design of this coin is based upon a facet of Game of Thrones in which we find that a gold coin featuring the hand sigil of House Gardener is still in circulation some three hundred years after the Gardeners have become extinct. The reign of Joffrey Baratheon takes place at the core of Game of Thrones as we enter it. This solid brass coin is a reminder of this dark time. Straight from the Periodic Table comes this "coin". Handcrafted in the U.S. and highly detailed. Replica of the iron coin given to Arya Stark in Game of Thrones. Pure Silver, made in the U.S.
Packaging unfolds to reveal information and history about each coin. Included are coins from Moria, Hollin, Mordor, Rohan, and Old Dale. Our Faceless Man Coin Necklace Silver is a replica of the iron coin given to Arya Stark in Game of Thrones. Arya Stark receives this coin in the course of her travels and initially discounts it as valueless. As it happens, this is not a coin in the usual sense, but a recognition token for members of the Faceless Man organization. Our Faceless Man Coin Necklace is a replica of the iron coin given to Arya Stark in Game of Thrones. Arya Stark receives this coin in the course of her travels and initially discounts it as valueless. As it happens, this is not a coin in the usual sense, but a recognition token for members of the Faceless Man organization. Our Piece of Eight is a replica of the real of silver (Piece of eight) coined during the reign of Felipe IV in 1635. More recently the piece of eight was the center of discussion in the movie Pirates of the Caribbean: At Worlds End. The Richard I and Richard III Medieval Coin Set comes with two different medieval coins - Penny of Richard I and Gold Angel of Richard III. A Gold Angel is a coin, first used in France in the year 1340. Our Historic Roman Coin Set comes with two different roman coins: Denaruis of Caesar and Gold Stater of Catuvellauni. Dates from 45-20 BC. Our Roman Coin Set Three comes with two different Roman coins: Sestertius of Nero 54-68 AD and Denaruis of Titus 79-81 AD. Our Saxon Coin Replicas Set comes with two different Saxon Silver Pennies - Penny of Aethelred II 997-1003 and Penny of Harold II 1066. Our Viking War Coin Replica is a Silver Penny, struck by the Vikings of York in the 920's A.D. Called St. Peter of York money by the inscription. Our WWII George VI Nickel Brass Threepence 1936-1952 in an Original Coin. During World War II three pence would buy one weeks ration of tea, 1lb of rice or two whole herrings. Our Shipwreck Pirate Coins are highly detailed replica "shipwreck" pirate coins in made of cast metal. The 3 coins vary in size from 3/4" to 1". Included a Gold Doubloon and Silver Pieces of Eight. Our Replica Gold Doubloon Coins set has four gold doubloons, marked with the seals of King Philip V and minted in the year 1736. With the conquest of Mexico in 1519, the Spanish put the native Indians to work mining gold and silver. This small silver stag piece is from the mythical realm of Westeros shortly after the unification of that land by the event known historically as Aegons Conquest. This is a replica coin from Game of Thrones. This silver "stag" piece is from the mythical realm of Westeros late in the tenure of the Targaryen kings, some 280 years after the unification of that land by the event known historically as Aegon's Conquest. Aerys II is better known as "The Mad King". Jaehaerys Targaryen is also known as "The Old King" or "The Conciliator". He was the fourth Targaryen King and a dragonrider. This Pewter Pieces of Eight Set is cast from reproduction pieces of eight. The picture shows the front of the coin in the top row and the back in the middle row. They are made a little thicker than the originals. The dominant small-coin of the Braavosi currency system is the Braavosi Iron Square. Officially licensed by George R.R. Martin. Packaging unfolds to reveal information and history about each coin. Included are a three pence, penny, half penny, and farthing. This Set of 6 Brass Half-Pennies from 6 Houses is based on the A SONG OF ICE AND FIRE series of novels by George R.R. Martin. This set includes Houses Stark, Greyjoy, Lannister, Martell, Baratheon, and Targaryen.